Embertone are a US sound company founded in 2012 by composers Alex Davis and Jonathan Churchill. The two self-professed ‘sample-library nerds’ began making sampled instruments for their own use; this led to the release of a range of small-scale libraries, diverse in nature but unified by their eclecticism, musical focus and affordability. Notable among Embertone’s catalogue are several titles which address the perennial problem of creating playable violin-family solo instruments, the sample world’s equivalent of solving Fermat’s Last Theorem. Among the numerous challenges are replicating the initial bow attack (which varies from a light caress to a vigorous sforzando), emulating the way vibrato and dynamics interact to add expression to developing notes, and most importantly, nailing the smooth timbral contour of legato melodies. Packing 4000 samples and a multi-faceted Kontakt interface, Embertone’s Friedlander Violin is constructed from no-vibrato performances by violinist Dovid Friedlander, recorded in a dry studio acoustic. While the absence of a lush Hollywood sound and any trace of a baked-in espressivo delivery may first appear unflattering, this austere approach is essential to giving users full control over the sound. A highly realistic vibrato is achieved by a multitude of simultaneous scripted background modulators; users can choose between various presets (gentle, passionate, progressive, etc) or sculpt their own customised vibrato style. The violin’s ‘Full — MW’ instrument uses the mod wheel as a combined vibrato and volume controller, so pushing up the wheel makes the vibrato grow in intensity as the note gets louder. This is a great way of performing expressive live melodies, but if you prefer to have separate dynamic control, there are patches which assign volume to the expression pedal. Alternatively, you could use the cheap-as-chips ‘Touch OSC’ MIDI controller app to perform swells, fades and vibrato surges on your iPad (not included with purchase). Friedlander Violin has two true, interval-specific legato modes: slurred, in which the player changes note under an unbroken bowing movement, and ‘bow change’, where the target note is articulated with a change of bow direction. The instrument (which organically tracks and displays your playing style) defaults to bow-change mode on legato transitions: to select the more fluid-sounding slurs, you hold down a momentary low C# keyswitch. An excellent and very welcome portamento delivery allows you to glide from one pitch to another, with velocity governing the glide speed. Taken together, these articulations are the heart of the instrument, transforming what would otherwise be a series of disconnected bow scrapes into joined-up, flowing, expressive and evocative melody lines. In a more supportive vein, styles such as straight polyphonic sustains with a choice of harsh or normal attack, staccato, tremolo and pizzicato are all very effective. Additional facilities include an Ensemble mode, which creates a virtual violin ensemble of anything up to eight players (it sounds a little synthetic, but works fine for pads), and a Bow Noise Reduction feature, which smooths and softens the tone. There’s also deep programming control of niceties such as legato transition speed, portamento velocity threshold and vibrato amplitude, factors which admittedly would not play a part on a Motörhead album. The Friedlander Violin can be used for all styles from country to classical, and if programmed carefully, it’s capable of virtuosic, lightning-fast performances: not since Garritan’s long-discontinued Stradivari virtual instrument have I encountered such a playable, natural-sounding and flexible solo violin. Two years in the making, Fischer Viola, the most recent addition to Embertone’s Intimate Strings series, consists of nearly 6000 samples performed by Christopher Fischer on a prized 20th-century Italian Bisiach instrument. The instrument works along the same lines as the Friedlander violin, offering two styles of legato along with portamento, sustain, tremolo and pizzicato (including ‘Bartok snap’) and staccato; the latter articulation’s length can be commuted down to a short spiccato with a MIDI CC controller. The viola trumps the violin by incorporating p and mf legato dynamic layers: the two sample sets have been cunningly phase-locked so you can cross-fade between the two dynamics with impunity. Furthermore, Fischer Viola uses a superior ‘VSL-style’ legato mode in which prior notes are retriggered when they continue to be held down. I don’t know why more companies don’t adopt this approach; it’s intuitive and offers ultimate flexibility for trills and grace notes. As with the Friedlander instrument, portamento is a core feature, adding soaring romantic slides and, if needs be, a Bollywood flavour to the repertoire of this fine-sounding viola. On a more subtle level, tonal variations such as a virtual con sordino (muted), a real, played sul ponticello (‘on the bridge’) and the mellow ‘over the fingerboard’ sul tasto bowing are useful options for an exposed viola passage. A Color control allows you to create different timbral shadings by moving the bowing position to any point between the bridge and the fingerboard. Another helpful feature is the additional Ghost Key keyswitch, a silent note which you can play to set the start point of a bend or portamento slide — a very good idea. Friedlander Violin and Fischer Viola are 3.5GB and 4.33GB respectively (installed sizes) and run on the free Kontakt 5 Player as well as the full version of Kontakt. Both instruments are available in 16-bit and 24-bit versions. I tried both, and could hear no difference. Really. Having almost (in their own words) “developed carpal tunnel syndrome and been sent to the loony bin” while obsessively recording samples of a 28-note toy piano, Embertone’s principals know the insane amount of work involved in deep-sampling an instrument. For that reason, you’re unlikely to see this outfit releasing a 40-volume, pan-symphonic collection any time soon, but watch this space: in an industry where big is too often seen as best, the value of such small, mobile, intelligent companies should not be underestimated. 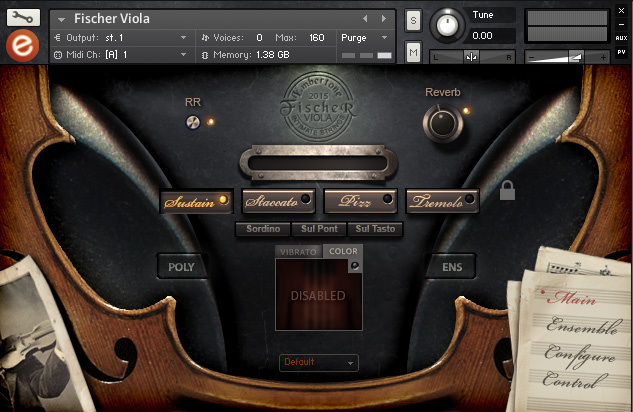 Friedlander Violin 16-bit $120, 24-bit $125; Fischer Viola 16-bit $120, 16-/24-bit bundle $125.